We take a break from our usual ski-based coverage to talk about another amazing experience that we encourage all adventure holiday lovers to try out! White water rafting. The first time I did it (in Switzerland around 20 years ago) I got knocked out of the boat by a giant log, so taking safety precautions is definitely recommended. White water river rafting is one of the most enjoyable activities imaginable. If you are new to it, it may look intimidating. However, you can enjoy the activity safely as long as you use proper white water rafting technique and take the proper safety precautions. Armed with the requisite knowledge, you can approach white water rafting with confidence. The following tips will help you make the most of your experience. 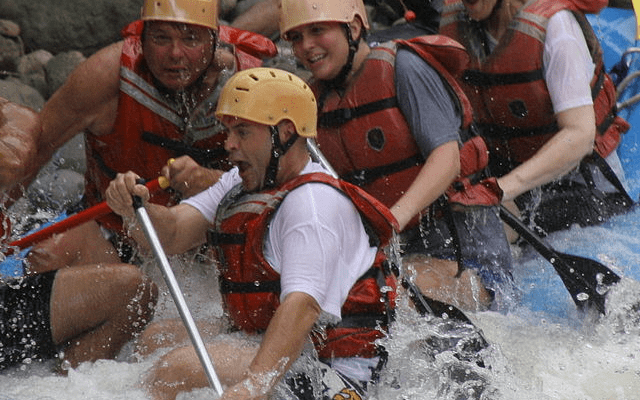 The first step to the right white water rafting trip is to choose a company that is a licensed, experienced outfit that will give you the epic experience you deserve. White water rafting can be a risky proposition if you do not go with a company you can trust. A licensed rafting outfit will allow you to enjoy your adventure with peace of mind. Getting into a raft without the right safety gear is an exercise is insanity. White water safety gear starts with a life jacket. You should never enter the raft without wearing one. You should never push off the bank without also having your helmet buckled on in addition to your life jacket. If you go with a licensed white water outfitter, your guide will show you how to paddle properly as part of the experience. However, coming into the trip armed with experience can’t hurt. The key to white water paddling is to keep your hands in the right position. Your inside hand should hold the top of the paddle firmly at the T-intersection. The outside hand should hold the paddle firmly at the base. With these two firm grips, you can do your part to guide your raft by following the instructions of your experienced guides. Holding the paddle correctly will also ensure you don’t lose your grip and accidentally hit yourself with it. This sounds like something that should be obvious, but staying in the boat is not always an easy task when you are being tossed around by the rapids. When your guide yells out that you are about to hit a bump, you need to brace yourself with the proper technique. When the guide yells, “Bump!” you lean into the boat with your blade end of the paddle up in the air and the T-intersection down in the bottom of the boat. In this position, you will be braced for the rapids able to stay inside the raft. Despite your best efforts, you may fall out of the boat eventually. If that happens, it is important that you know how to stay calm. You also need to know how to swim so that you can avoid obstacles like rocks in the water if you do get thrown out of the raft. Staying calm and avoiding obstacles is all you need to do, and you will be scooped back up by the raft before you know it.